AFC Rushden and Diamonds, of course, were formed from the ashes of their old club after the original Rushden and Diamonds went into financial meltdown a few seasons back. The club was formed in 2011, playing their first season as a youth side due to being unable to find a senior league to join in time. They finished 5th and won the NSYL Knockout Cup 4-1 against AFC Kempston Town. 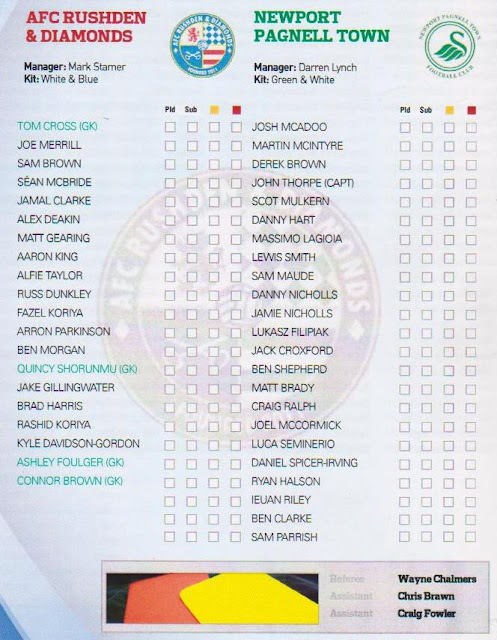 The following season they converted to a senior side, entering the United Counties League Division 1 and winning promotion at the first time of asking. The club shared at Raunds Town for the first year of their existence, however since becoming a senior side they had moved over to Wellingborough. Looking at the league table, AFC Rushden sat in 5th place in the table on 38 points, while Newport Pagnell were down in 19th on 14 points. I was looking to do something fairly local tonight, as I have another game in Portsmouth v Wycombe on Wednesday, and what with starting at 4am on both the Wednesday and Thursday mornings, I was concerned about getting tired. 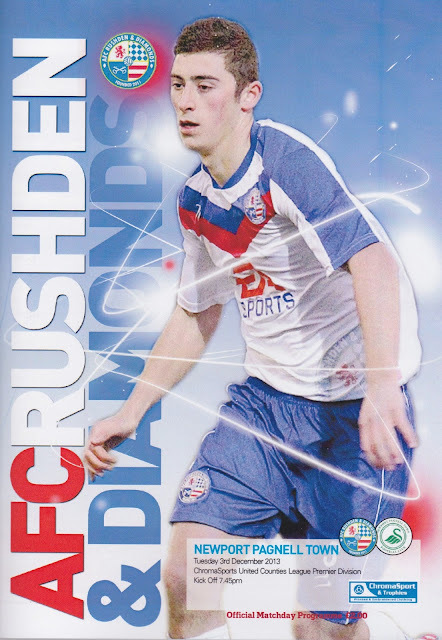 Initially, I selected a few games from some of the step 5 leagues I am looking to complete - the Hellenic and the Spartan but then Anwar suggested AFC Rushden & Diamonds v Newport Pagnell Town. It sounded like a good shout and was fairly local, so it was planned in. On the day I had the day off work so just lazed about at home. It was getting noticeably colder as winter was setting in so I made sure I wrapped up warm when I left at 5PM. I got to Anwar's at 5.35 and for once he was waiting for me which showed how keen he was! There was a bit of traffic on the way, nothing serious, although we did have the horrible experience of having to go through Milton Keynes, which is becoming ever familiar now. We got there just after 7 and were looking for somewhere to eat. There was nowhere we fancied within walking distance, not without cutting it fine for kick off so we went straight to the ground. First stop was the club shop, which unusually for non-league was outside the ground. 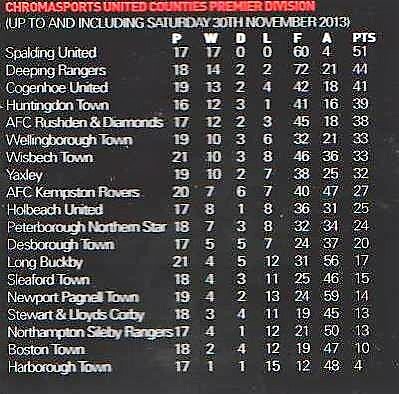 It was excellent and from what I gather it was shared with Wellingborough Town. 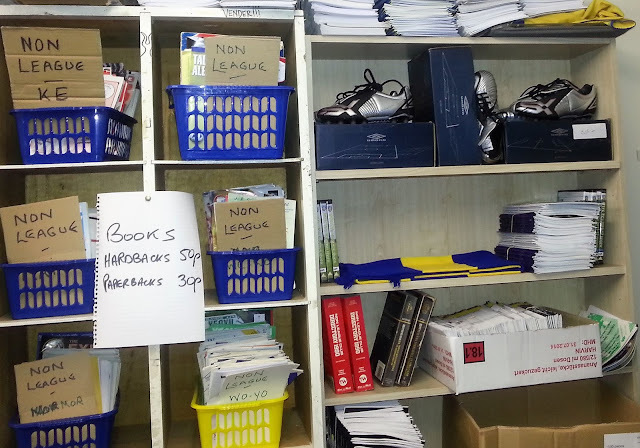 I got a few nice things in there - the night's programme for £2, a book called 'Ten of Diamonds' which told the story of the formation of the original Rushden & Diamonds club, a book about the troubles at Brighton under dodgy owners Archer and Belotti for 50p and finally an AFC Rushden & Diamonds pen for £1. I had noticed the entrance to Wellingborough Whitworths FC right next door when I walked into the entrance to the ground - sadly the dark stopped me getting some pictures of it. We paid our money to get in and after checking Facebook for updates I took my camera out, ready to take a picture to upload to Instagram. As I fired up the camera app the floodlights went out and I feared I'd had a wasted journey. Despite around a 20-minute delay though, they fixed the problem and the kick-off was delayed by just 5 minutes. I passed the time by getting some chips, which although not the nicest I have tasted, were a good portion size and a good price at £1.50. During the game, I met Stacey who I had briefly spoken to on Facebook a while back and we had a good chat about the old days of when our teams used to face each other in the football league. I also met a bloke who looks on the non-league forum that I post on and who had seen I was coming. 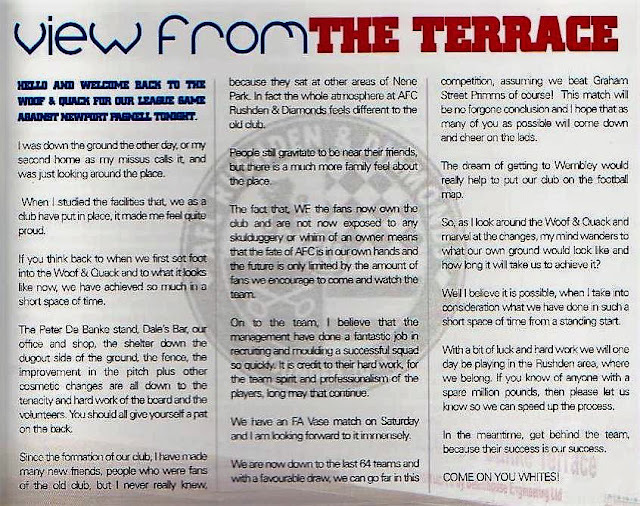 He told me lots of interesting stories, including the tragic death of their former goalkeeper Dale Roberts, which proved that Paul Terry was just as much of a git as his more famous brother. The short story is, that Terry had an injury and had to go to treatment every day. As he lived so far away, Roberts offered him a place to stay. Then while Roberts was away with the team, Terry was shagging his girlfriend behind his back. This led to the couple splitting up, although they did get back together eventually. Unbeknown to the team, Roberts was suffering from depression and one day when he didn't turn up to get the coach to Eastwood for an FA Trophy game, the manager sent Roberts girlfriend round to see what was up. It was then that she found he had hanged himself. A very sad story in which there were no winners and a tragic waste of a young life. In his memory, there is a nice bar at the ground, which has lots of his pictures and old shirts up, including the one from his final game for England C.
The game saw the hosts take an early lead when Alex Deakin headed home a Jake Gillingwater free-kick. The rest of the first half continued to be a damp squib. That was until a couple of minutes from half-time when Jamie Nicholls fired home from a fair way out following a decent cross from Sam Parrish. Half chances came and went with Newport Pagnell defending stoutly but they were finally undone on 83 minutes. A loose ball in the box was headed home by Russ Dunkley. After the game, we set off home and made good time. I was back at Anwar's around 11.15, arriving back at mine around 11.40. I was still wide awake having got up quite late and so stayed up until just after 1, getting just 3 hours sleep. This is precisely what I wanted to avoid as I had another game at Portsmouth v Wycombe the following day. THE DOG AND DUCK STADIUM is a decent ground for this level and is probably fit for step 4 football. It has seen a few improvements since AFC Rushden moved in with Wellingborough, The new stands added are a terrace called 'The Peter De Banke Terrace' (they had one of that name at their old ground Nene Park This is a metal stand so it can be taken with them when they move. The other addition is some cover on the dugouts side. All in all these 2 have added around 500 extra covered spaces in all. The one remaining stand from Wellingborough is a decent main stand, holding around 200. The rest of the ground is open and flat standing. 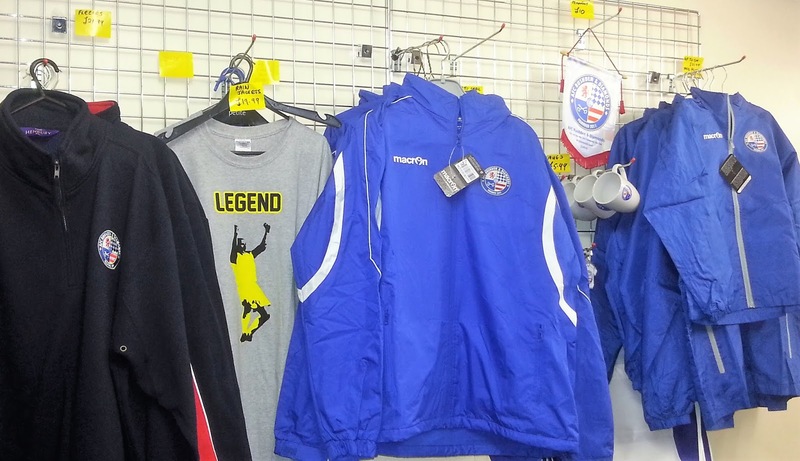 As mentioned above, the club shop is excellent with a decent range of stuff for sale. 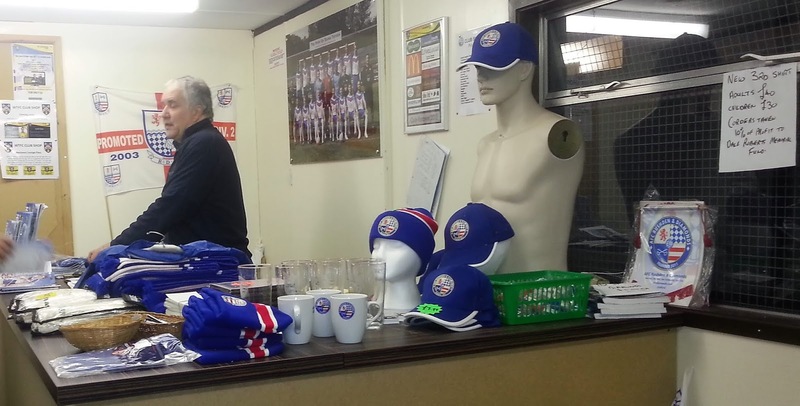 The tea bar and bar are pretty standard for non-league level. In addition, there is Dale's Bar, in memory of their late keeper Dale Roberts. This has a good range of drinks, sweets and crisps. 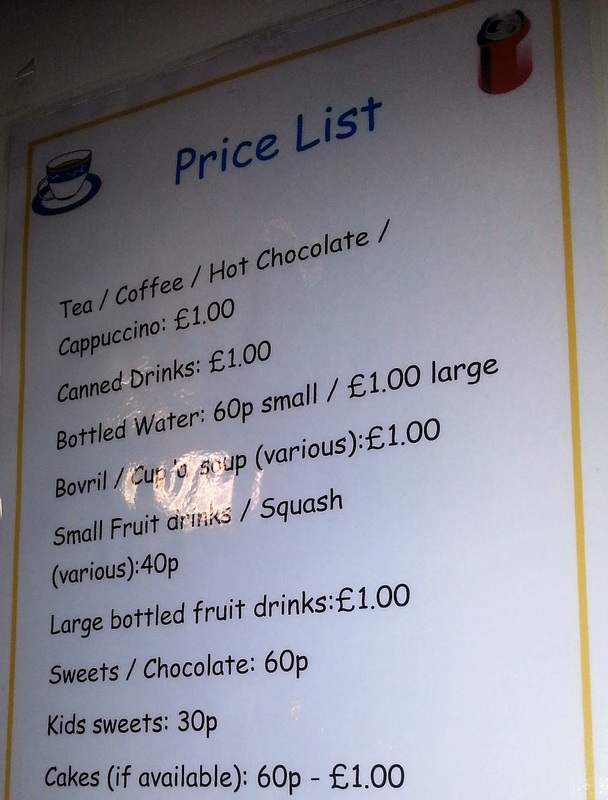 Especially good value are the hot drinks, which come in a very big cup for the decent price of £1.